This coffee house mug has a uniquely curved design for those who enjoy a little style with their first sip. It holds 15 oz., has a matte finish on the outside, and a glossy inside. It stands approximately 4 7/8" high and meets FDA requirements. We recommended you hand wash this item to get the longest use out of it. 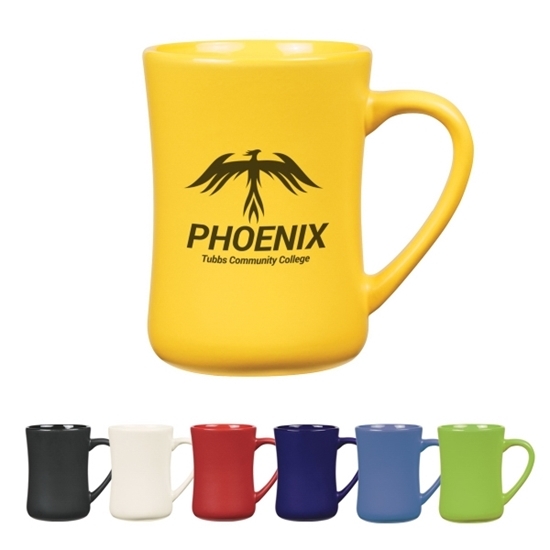 Silkscreen your company logo on it to stand out from the competition as well as the other mugs in recipients' cabinets! This will be one they always grab, giving you increased recognition! Imprint Area: 1 1/2" x 2"